Traditionally these lightweight, stiff rucksacks for primary school children called randoseru, from the Dutch word ransel, came in only two colours: black for boys and red for girls. The colour coding of boys and girls rucksacks continued for more than 100 years since their introduction in 1885 (Penttinen, 2011). Due to the uniformity of their colour and design the use of randoseru has been described as part of the process of "inculcating group values"(Samovar, Porter, & McDaniel, 2011, pp. 402). Each weekday morning small groups of elementary school students assemble near their homes and set out for their school house in classic military platoon formation... 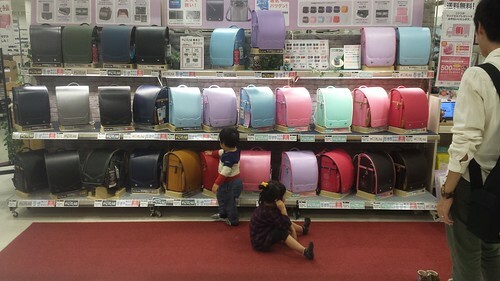 They also carry the ubiquitous backpack (randoseru), identifiable throughout Japan in shape and size and differing significantly in only the color —predominately red and black, but occasionally another color. The back packs mark the wearers as elementary students and the hats denote the school attended. In the 1990s, however, with the advent of feminism and increasing individualism there was pressure on schools and randoseru makers to provide rucksacks in other colours. It is only in the past decade that non-black non-red randoseru have become popular. A Google image search for images of randoseru stipulating before 2010 shows rucksacks in predominantly the two traditional colours. Primary school children now commonly wear rucksacks in all the colours shown here. Samovar, L. A., Porter, R. E., & McDaniel, E. R. (2011). Intercultural Communication: A Reader. Cengage Learning.